The rugged durability of Nelson Big Gun® Sprinklers makes them a favorite for coal pile dust suppression. 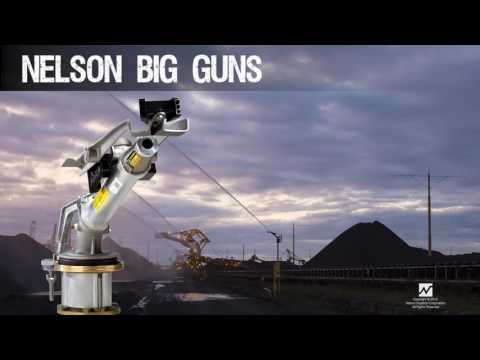 With completely sealed ball bearings and anodized, powder-coated, or stainless steel options, Nelson Big Guns are built for the corrosive environments typical of coal terminals. The superior performance provides optimal coverage with less equipment and maintenance than other more inexpensive options. High trajectory models can easily achieve the necessary stream height to clear the coal piles, and they can also be mounted on tall risers or towers to further increase coverage. The Big Gun’s field-proven nozzles are less likely to plug, requiring less filtration and allowing the use of reclaimed/recycled water or wastewater – saving energy and water. Nelson Big Gun® Sprinklers – a clear winner in the battle of fugitive dust control. Backed by Nelson Irrigation's years of experience in coal pile dust control. • ANODIZED, POWDER COATED, or STAINLESS STEEL BIG GUNS for sprinkling with corrosive waters. • COUNTERBALANCE KIT for operation of the Big Gun with a tilted riser. • HIGH TRAJECTORY 43° to clear the top of the piles. • ADJUSTABLE TRAJECTORY 15-45° allows you to customize the equipment to your needs. • WEDGE INSERT for modified trajectory of low-angle Big Guns. • HEAVY-DUTY BRONZE BRAKE for operation in environments with airborne, abrasive, dust particles (100 Series only). • SYSTEM AUTOMATION AND INTEGRATION is seamless and simple when using the Nelson Control System. Using Nelson Big Gun® Sprinklers in conjunction with Nelson 800 Series Control Valves and the Nelson Control System provides a complementary design that uniquely improves efficiency and reliability. Nelson’s rugged 800 Series Control Valves have a field-proven record of success operating under Nelson Big Gun Sprinklers in tough environments. Automation using the Nelson Control System is simple, reduces labor requirements, and allows you to put the right amount of water where you need it most. Spend less time worrying about the wind and more time protecting your investment – contact your regional Nelson representative for more information about coal dust suppression on your project. The New R75M is being used in coal mine operations to wash coal and debris away from walkways and other critical areas. It operates between 40 and 60 PSI and delivers 30-37 gpm.